Qi is a contextual concept that is present in Eastern philosophies, culture, and medicine. Although there may only be one “Qi” that permeates all things in the universe, how it is defined depends on how it is utilized or experienced. In Western society, a common reference to qi is in the context of Martial Arts and Qigong where physical movements cultivate and deploy an invisible energy or force. Acupuncture and Traditional Chinese Medicine utilize qi which is an invisible substance that circulates through the body in pathways called Jing Luo 经络. In Chinese calligraphy, the tools are simple. An ink stick, ink stone, brush, and paper or silk. The calligrapher, using a narrow set of guidelines, must compose characters with a balance of black and white space to the canvas. The ink is semi-transparent preventing any retouching or correction. Much like a dancer, the strokes are performed in a sequence of choreographed movements with rhythm. In executing a stroke, the artist should feel confident and at no time hesitate or the rhythm will be broken. The paper or silk quickly absorbs the ink, so the speed of the brush and the downward pressure dictate the thickness and density of the ink. A calligrapher may slow a stroke much like a singer holding a note, or play with the rhythm by using the speed and pressure of the brush to create light and dark tones. Every stroke of fine calligraphy has the energy of a living thing and embodies the emotions, temperament, spirit, and qi of the artist. Like the physical arts that cultivate qi, breathing and body posture is important in calligraphy. The brush is held vertically and, in the highest levels of the art, the arms and wrists never rest on a surface. The movements of the brush come from the body which is directed by the intent of the artist. It can takes years of training before a calligrapher can master this “Hanging Arm Technique 懸 肘” without shaking and it involves training the whole body. The mind and body must unite as one, and the brush is merely an extension of that unit and artist’s intention. Using a calligrapher’s brush is often compared to wielding a sword in taijiquan because both become conduits of the user’s qi. "Touching the Clouds" by Xutang Ziyu, a Chinese monk (1185-1269). Bold and full of energy which gives the viewer a taste of the artist's personality while the structure shows the simplicity of the Ch'an Buddhist thought. A rhythmic, yin/yang interplay of feathery dots and strong strokes. A poem by Song Emperor Huizong (1082-1135). Under Emperor Huizong's rule, calligraphy flourished because of his intense interest in the arts and culture. Notice the long, straight strokes that finish with a sharp angle and the snorkel-like hook that is used on initial pressure. His style was called "slender gold" because it resembled gold filament, twisted and turned. 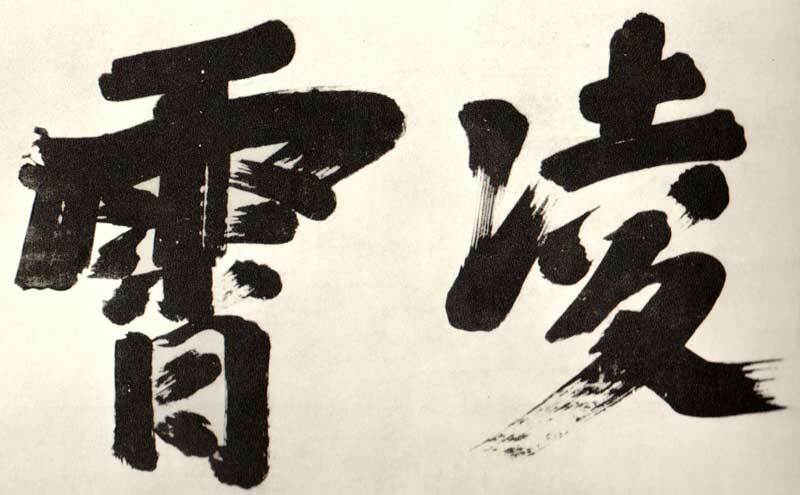 His calligraphy shows his conscious effort to go against the customary techniques of that era, his love of luxuries, and his introverted personality. The Battle of Red Cliffs was a famous event in the Han Dynasty and many painters and calligraphers were later inspired by a poem written by Su Shi (蘇軾). 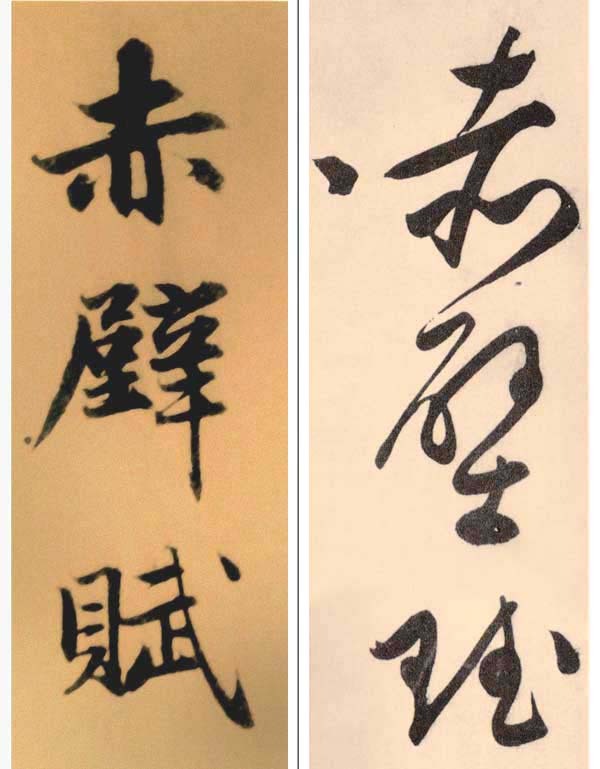 The example shown is a comparison of the words "Red Cliff Poem" by two calligraphers and demonstrates the immense scope of Chinese script and how the artist's personality flows from his brush making each unique. 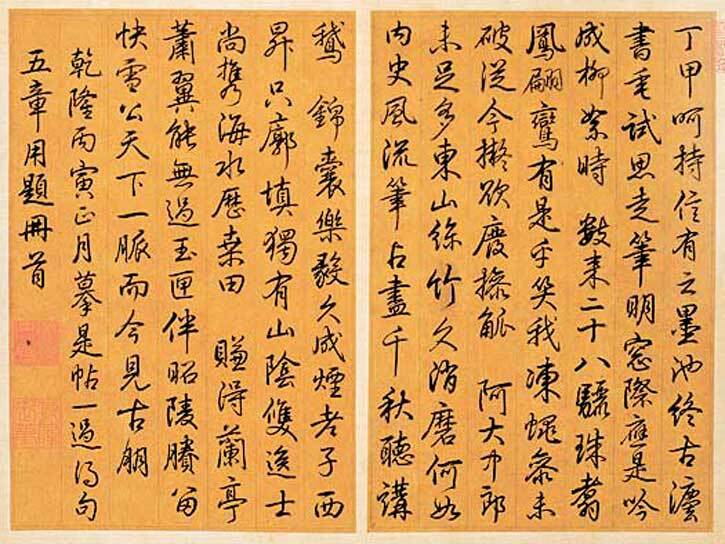 On the left is the text by Zhao Mengfu (趙孟頫, 1254–1322). Zhao Mengfu was a prominent scholar who advocated a return to tradition and the arts. He shows an elegant, flowing style that retains traditional form. The start and finish of each stroke is soft while demonstrating a strong sense of rhythm by using contrasting shading. On the right is the same text by Wen Zhengming (文徵明, 1470-1559). Described as a gentleman-artist, he relinquished his government duties to devote more time to the arts. 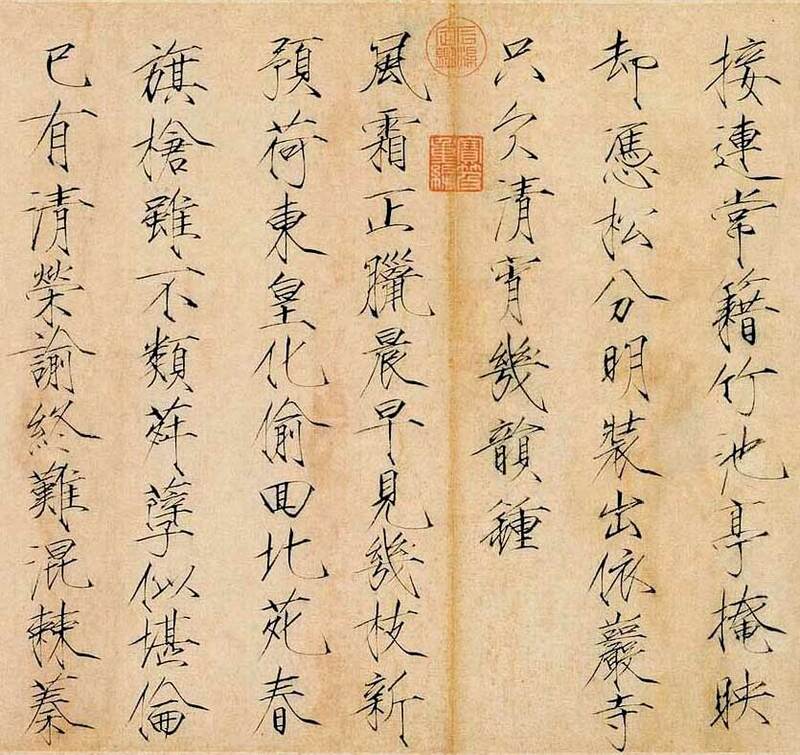 He wrote this when he was 75 years old and it reflects his interest in the free-flowing style of Huang Tingjian . Wang Xizhi (王羲之, 303-361) is traditionally referred to as the Sage of Calligraphy (書聖) and often credited with elevating calligraphy's status to an art form. He painted with elegant flowing rhythmical strokes, a style which was quickly adopted by the aristocratic communities of his era. His paintings and calligraphy have a feeling of strength through isolation, which reflects his discontent with life as an official. The style of Wang Xizhi became a compulsory model for orthodox schools of Chinese calligraphy and his works considered a nearly unattainable goal for mastery of the art. Viewing a piece of calligraphy is like listening to a song or viewing a painting. Although the artist is not present, the calligraphy allows us to experience the weight of the artist’s brush, the speed of his strokes, the pauses, thrusts, hesitations and how he starts and finishes each stroke by placing and lifting the tip of the brush. It is like a recording of the original event. Ancient Chinese claim that a person’s true character is revealed in his calligraphy.